Following adjustment for the Sun's own movement through space towards the Solar Apex, interstellar visitors would likely have a more or less random distribution to their radiants (the position in the sky from which they came, rather like meteor showers striking the Earth's atmosphere). The Spanish team carried out statistical analysis on the emerging sky maps of these radiants, and looked for patterns or clusters of these origin points. Statistically significant patterns did indeed emerge from the data. A particularly large source was located in the zodiacal constellation Gemini. Such a clustering might indicate a number of possibilities, which the astrophysicists explore in their paper. One possibility is a close flyby of a star in the past which could have disrupted the outer edges of the distant Oort Cloud, sending comets in-bound towards the Sun. Looking at the tracking of candidate flybys in the (by Cosmic standards) relatively recent past, Carlos de la Fuente Marcos, Raul de la Fuente Marcos & S. J. Aarseth argue that there is a possible correlation between this cluster of hyperbolic orbit radiants in Gemini, and a close flyby of a neighbouring binary red dwarf system known as Scholz's star some 70,000 years ago (2). At a current distance of about 20 light years, Scholz's star may be a close neighbour to the Sun relatively speaking, but even so it took a while for it to be discovered. This was probably because of a combination of factors: Its proximity to the Galactic plane, its relative dimness, and its slow relative movement across the sky (3). Its distance was less than a light year 70,000 years ago, and its rapid movement away from us in the intervening time helps to explain why it was difficult to detect as a neighbouring binary star: Its retreating motion is mostly along our line of sight, making it difficult to differentiate from background stars. 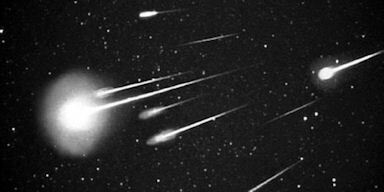 Seventy thousand years seems like a long time, but it may not be enough to witness the arrival of perturbed long-period comets from the very outer realms of the solar system. That said, we are talking about hyperbolic trajectories here, rather than the usual, calmer parabolic ones. So, perhaps in the case of these rapidly moving objects, there has been time enough? My back-of-an-envelope calculation shows that if 1I/'Oumuamua travelled at the same rough velocity as it did when it was observed over the last 70.000 years, that it could have covered about 6 light years in that time. This is, of course, further than the nearest star. But that would assume that 1I/'Oumuamua was travelling in a straight line, like a cosmic bullet, for all that time. Even if it was on that kind of cosmic trajectory, and had come under the influence of the Sun, then there would be an additional sling-shot effect at play at the point when we astronomers observed it at perihelion, which would have speeded its pace up considerably. Further, if this was a long-period comet which had been given a gravitational nudge by a passing star, then its motion would not be a simple straight line velocity through space either. According to Kepler's 3rd law, comets speed up when closer to the Sun, nearing perihelion, and then slow down when moving back toward their most distant, aphelion position (4). So, a perturbed comet from the outer Oort cloud would take a lot longer to get here than my back-of-an-envelope calculation suggests. A stellar flyby would not cause a perturbed long-period comet to come shooting straight at us like a bullet from a gun. Instead, it would take a more leisurely route around the celestial houses. If it was not Scholz's star that caused this particular disturbance in Gemini, then older stellar flybys could have set these cosmic wheels in motion. There is something of a back-catalogue of stars which likely invaded the Sun's personal space at some point over the last few million years (5). This new work could stoke up this contentious argument still further, to the dismay of astronomers who might have hoped this whole subject had been put to bed long ago. There is also the potential for more red dwarf flybys emerging from the cosmic woodwork over time, too. There has been a reliance upon the Hipparcos astrometric catalogue to make systematic searches for such objects in our galactic neighbourhood. The problem with this is that this catalogue seems to contain a relatively small number of M dwarfs compared to their known galactic population. Increased use of another astrometric catalogue, known as Gaia, should pull up more of these neighbouring, dim red dwarfs which Hipparcos has missed (3). Perhaps the use of Gaia will bring out more besides, like ultracool brown dwarfs in our immediate neighbourhood? Cooling, older brown dwarfs seem to lose their cloud cover, astronomers have observed (1). Perhaps emulating the aging of a fiery red-headed young man into a cooler, balder gentleman, there seems to be a transition temperature where the fiery locks dissipate. 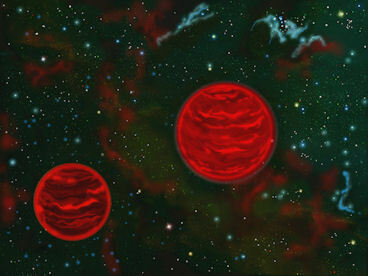 A brown dwarf at the lowest end of the BD mass spectrum, weighing in at 11–12 Jupiter masses, seems unusually red - so much so that it was thought to be a binary object, rather than the planetary-mass object now assumed from its seemingly youthful age. The age of 2MASS J13243553+6358281, at about 150 million years, is deduced from the company it keeps. It travels with the AB Doradus Moving Group (2), and is one of the nearest known planetary-mass objects. Its age and mass place it in the tricky transition phase between the young, hot L-type dwarfs and the older, cool T-type dwarfs; an issue that has been understood theoretically for a while (3). There's quite a lot of context here, so let's explore this transition zone in a little bit of detail. Many sub-brown dwarfs and brown dwarfs rotate quickly, like Jupiter. It was theorised that the hot, dense clouds of the L-dwarfs would eventually thin out and disappear. At some point during this slow, cooling process a variation in cloud cover would be evident (as on Earth). At this transition stage, then, it might be possible that relative short periods of observation of these rotating brown dwarf objects should show a variability in their visible properties with time. Naturally, a tightly bound pair of binary objects needs to be excluded first, as this, too, would create a similar variable appearance as they dance around each other. In our solar system, Jupiter's complex cloud system shows significant patchiness, where breaks in the cloud cover expose hot patches below. Planet mass objects which are larger than Jupiter would, presumably exhibit more extreme variation still. This was the theory before many brown dwarfs had been spotted, and it seems to have worked out pretty well as more of these objects have come to light, as it were. Nonetheless, the 'L/T transition state' is a variable zone where the properties of 'inbetweener' planetary-mass brown dwarfs remain very difficult to predict. Multiple factors are at play, including complicated chemistry within the clouds and weather variations across the brown dwarf's atmosphere. So when does this patchiness begin? At what temperature; at what age; at what colour, even? "“L dwarfs” are hot brown dwarfs, which range in effective temperature from ~1400 K to just over 2000 K. They have significant cloud decks—made of iron and rock!—which blanket the surface in a dusty layer. Brown dwarfs cool as they age, and eventually become “T dwarfs.” These T dwarfs are colder brown dwarfs (under ~1200 K). They seem to have clear atmospheres, without a significant cloud layer. The colour of a failed star seems to depend significantly upon the properties of the clouds within its atmosphere. Below around 2500 Kelvin, 'hot' brown dwarfs (L-dwarfs) feature 'exotic' dust clouds (5). 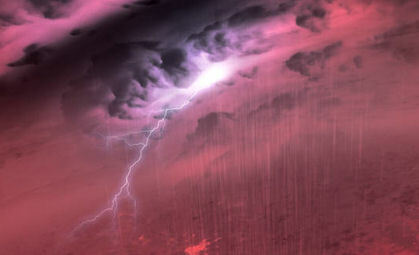 These clouds are laden with silicate dust (or rock) and literally rain scalding-hot liquid iron. Not particularly hospitable, for sure, but this dusty property helps explain their distinctly red colour. 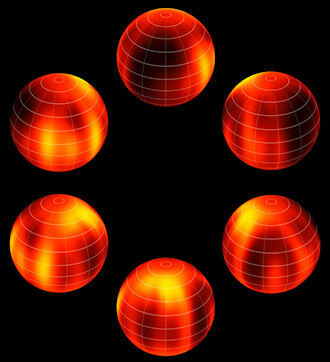 As these L-dwarfs cool and age, they gradually turn into the cooler T-dwarfs. It is thought that during this L-T transition phase, the mindwrenchingly powerful iron/rock-laden condensate clouds gradually dissipate, becoming more and more patchy until, eventually, they are gone. This seems to be the case with the T-dwarf 2MASS J21392676+ 0220226 (2M2139), for instance, whose appearance appears so highly variable as it rotates that observing astronomers concluded that its atmosphere is highly fragmented (7). The way this light variability has been modelled against changes in cloud cover has been neatly illustrated in a short video released by NASA Spitzer (8). 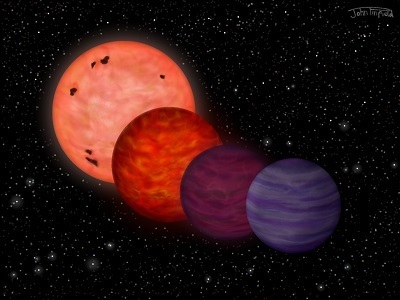 The new research finds another particularly red brown dwarf - one whose age can be relatively well determined. It lies within the L/T transition zone, but is at the lower end of the brown dwarf spectrum, almost being a planetary-mass object (or sub-brown dwarf). So, its properties are helpful for determining the L/T transition point for ultracool dwarfs such as 2MASS J13243553+6358281 - a class of objects which interest me particularly. In this particular case, the transition phase from cloudy to cloud-free seems to occur around 1,150 degrees Kelvin (2), when around 150 million years old. Astronomers hoping to verify the existence and location of Planet Nine have been frustrated by atmospheric turbulence. With their preferred observation target of Orion/Taurus now dropping below the skyline as Spring draws near, Dr Mike Brown and his team have had to abandon their hunt for the missing planet in the outer solar system. Dr Brown had managed to gain valuable observation time to use the Subaru telescope located on Hawaii's Mauna Kea mountain. But the atmospheric conditions, including high winds, have rendered the images he took of the candidate zone almost certainly useless (1). He'll now have to wait until the Autumn, when Orion emerges into the skies of the northern hemisphere once again - assuming, that is, that he is successful in getting another slot booked with his favoured telescope. 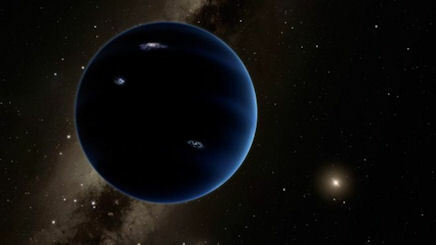 There is more bad news on the way for Planet Nine, this time in the form of results from a search for the object in the WISE and NEOWISE databases. The search focuses upon a particular infra-red wavelength, and covers up to 90% of the sky. I wrote to Mike Brown this week, just to give him the opportunity to say a few words for the new (quite scientific) Dark Star book. As of yet, no reply. This is not uncommon. Most of the astronomers I write to (generally to ask them about aspects of their published work) do not reply. This is frustrating for me, but they're busy people and, well, I'm not exactly a big-time journalist or editor. Also, there's the whole Nibiru thing. Nonetheless, I would welcome the chance at some point to flesh out the reason why I think this object defies efforts to detect it. If nothing else, it would be worth putting these unusual ideas to the test. Remember New Horizons? This spacecraft sent back incredible images of Pluto and its moon Charon a few years ago, before plunging deeper into the Kuiper Belt. NASA have released some new images - this time of two very distant Kuiper Belt Objects, known as 2012 HZ84 and 2012 HE85 (right). To be honest, at the sort of distances involved, they're not much to look at. But these images represent the most distant objects in the solar system every viewed by a space probe (1). 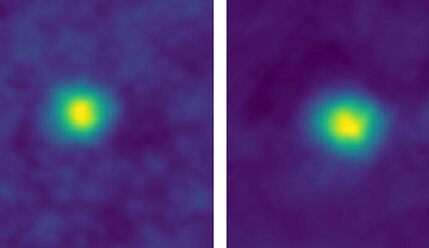 The team operating New Horizons were keen to determine whether these long-distant shots of the two KBOs would show up encircling dust or rings. The presence of such matter might have dire consequences for the probe when it approaches Kuiper Belt objects more closely. At the end of the year, it will achieve just that: a close flyby of 2014 MU69, which is thought to be a binary pair of Kuiper Belt Objects. Should KBOs be found to have extended rings and dust clouds attached to them, then the mission specialists will need to consider how close New Horizons an safely approach them. This thinking is of some interest to me. I have more than an inkling that dust shrouds are an important property of some very distant objects in the solar system. These KBOs, though, are safely confined within the Sun's Heliosphere, so I don't expect too much unusual gubbins attached to them. But the further out we go, the more likely that things could start to get weird. I'll explain more in my forthcoming new book.